Discover the pleasures of skiing in the Lusia Alps Ski Area! Explore the modern ski lifts and slopes of varying difficulty with perfect snow conditions guaranteed thanks to the snow-making programme throughout the skiing season. The area is served by 8 new generation ski lifts including 2 high speed 8-person gondola, 5 high speed quads, of which 3 with wind screens, and one ski lift for beginners. Lusia Alps | Perfect snow conditions! easy, very wide and always sunny. These are served by lifts 5 and 6. The famous Piavac run is the steepest run in the whole ski area, and thanks to the initial face it has become famous throughout the Dolomites. The run starts at an altitude of 2196m and descends to 1769m at the valley floor station of the Piavac chairlift – it's served by lifts 2 and 4. La Direttissima Le Cune, with a very steep initial descent – is served by the lift of the same name. Fiamme Oro descends from the top of the mountain cable car to the valley floor station. It's a black run through the woods with a steep gradient from the start to finish It's long, varied and enjoyed by expert skiers. It's served by lifts 1 and 2. The slopes here are generally very easy, wide and sunny – ideal for beginners and families. 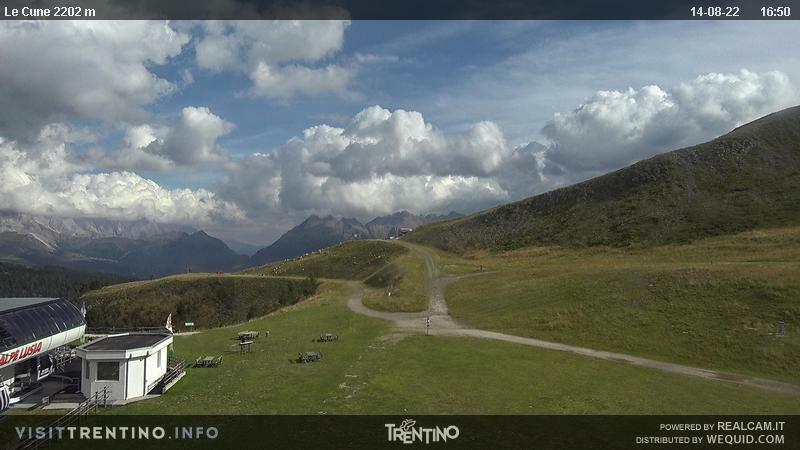 Enjoy breathtaking views, especially from the arrival point of the Lastè chairlift. The view over Pale di San Martino from here is superb! Castelir - Le Fassane: high speed chairlift. Le Fassane - La Morea: high speed chairlift. On a gentle slope, moments from the arrival point of the Bellamont lift, is a nursery slope where beginners can begin to develop their technique in perfect safety. Children and adults can try the first moves and turns on the snow and use one of the two magic carpet lifts to return to the top of the slope. For the very youngest there are two inflatable snakes, "Oskar e Rosi", and a tunnel filled with small obstacles in the form of woodland animals, giant flowers, pyramids and arches which will put a smile on everyone's face. Laricino Park is free and can be easily reached with a pushchair; parents can supervise their children from the colourful benches in the park......while at the same time enjoying the sun!